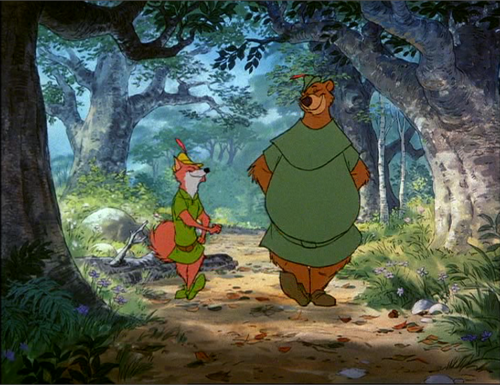 Disney’s 1973 animated adaptation of Robin Hood is not one of the studio’s most popular features, but it is one of their most quietly beloved. Being one of the first Disney animated films to be released following the death of Walt Disney, Robin Hood was released at a rough time for the studio. Though it was probably one of Disney’s most thoroughly entertaining features of the post-Walt era, and it’s still a lot of fun today. Robin Hood re-imagines the rogue hero and his friends and foes as anthropomorphic animals, with Robin Hood and Maid Marian being foxes, Little John a bear, Friar Tuck a badger, Prince John a lion and the Sheriff of Nottingham a wolf. The story is simple and episodic, following various adventures of Robin Hood and Little John as they rob from the rich and give to the poor, repeatedly thwarting the schemes of Prince John and his cronies, who have taxed the people of Nottingham into poverty. It’s an incredibly simple Disney film, but one that remains consistently entertaining due to the charming personalities of the characters, particularly the villains. Prince John is an egomaniac who throws tantrums like a spoiled child, and is complimented by his cowardly snake assistant, Sir Hiss. The movie also has a fun sense of humor, with both Robin Hood’s cunning heroics and the villains’ snidely deeds being exaggerated to comedic levels. 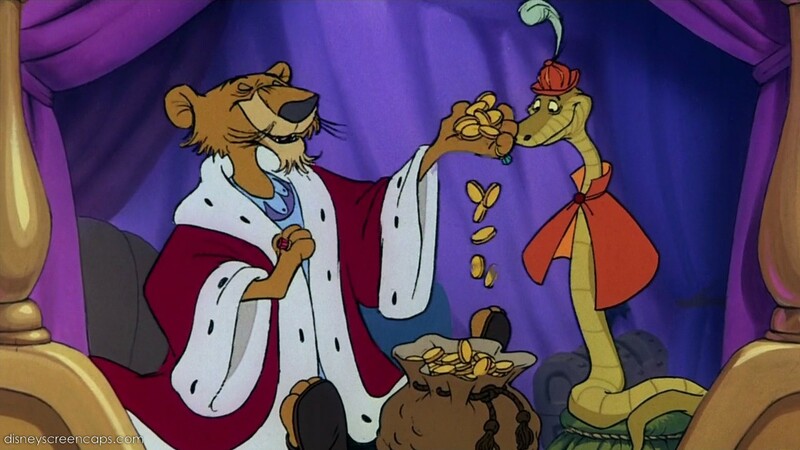 Robin Hood is constantly finding new disguises to outwit the bad guys, while the Sheriff of Nottingham collects taxes in cartoonishly villainous fashion (he takes one man’s money straight out of the cast on the man’s broken leg). 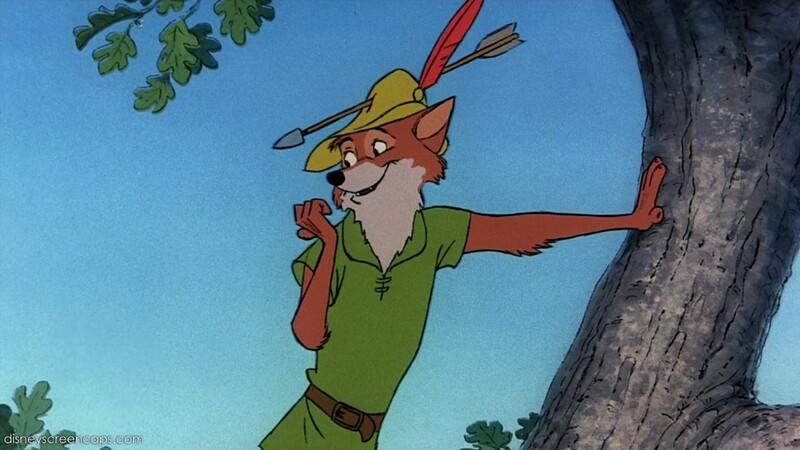 Robin Hood only features a small handful of songs, and although they aren’t the most remembered Disney tunes, they are charming nonetheless: “Oo De Lally” is a catchy, upbeat opener. “The Phony King of England” sees all the animals joining together in a humorous number that mocks Prince John. The Oscar-nominated “Love” is a sweet melody, while “Not in Nottingham” is fittingly melancholic. The animation is fun and lively, but unfortunately it also reveals the limited resources Disney was working with at the time, with some animated segments being recycled in different scenes, and sometimes the animation is simply replicated from previous Disney movies. Still, Disney made the best with what they had to work with at the time. As previously mentioned, the story is rather simple, and mostly shows up in small bursts, instead of one overarching plot. This leads some moments to stray from the main story a bit, which may be distracting to some. But it can actually feel like a nice change of pace at times. One such moment sees a group of kids (a few rabbits and a turtle, naturally) go into the courtyard of Prince John’s castle to retrieve an arrow, only to run into Maid Marian, who converses with the kids about her history with Robin Hood. The scene doesn’t seem entirely necessary, but it’s lovely nonetheless. The opening credits sequence is another highlight, and remains one of the great title sequences in animation history. Robin Hood may not sit at the top of the mountain of Disney animated features, but it is an underappreciated gem that, despite its production limitations, remains a delightful entry in the Disney canon that both kids and adults can enjoy.